Four channel, 100W, multi-mode, MIDI controllable guitar amplifier. The Colossus H-100™ amplifier is a unique and diverse hand-built guitar amplifier. It consists of four channels, each with its own gain, tone, bright, and level controls. The Colossus includes a very transparent tube buffered series effects loop, including Send and Return level controls. When bypassed the entire tube buffer section is removed from the circuit. This ensures the dry tone maintains maximum punch and clarity when the loop is not needed. Further, if the customer desires to bypass the loop indefinitely, the V5 tube may be removed. The preamp section of the Colossus is finished off with dual switchable master volumes to allow a boost or cut when selected. Finally, the Top and Bottom controls allow for high and low frequency negative feedback adjustment of the power section, similar to presence and resonance style adjustments found on other amplifiers. The Bottom control is especially useful for dialing in the low end ‘thump’ specific to your cabinet. The output power varies between 100 and 120 watts RMS, depending on the tubes installed. A number of different tube types are compatible with the Colossus and can be easily installed after a simple bias using the built-in test points and inexpensive DMM. In fact, the adjustment pot and test points are both available outside on the outside of the amp, therefore it’s not even necessary to remove the chassis when changing tubes! For maximum flexibility, each channel selection, distortion and fat mode change, master volume select, loop bypass, and mute functions are all switchable via a number of methods. All of these functions are controllable via the front panel. Further, all are also available via the RCI™ (Rhodes Custom Interface) and MIDI interfaces for foot switch control and system integration. RCI™ is an innovative means of connecting any number of KSR Amplification products for synchronization and control. Unlike MIDI, RCI™ is bi-directional, allowing for devices to communicate in both directions. As a simple example, take a Colossus amplifier and connect it via MIDI to an effects processor and generic floor controller. The Colossus was setup to change amp channels for different presets using the convenient MIDI Learn function. The Colossus foot switch is connected to the amp via RCI™. With this simple rig you can manually change channels with the amp foot switch or amp front panel, and say Channel 1 (Clean) is selected. If you select a patch with the MIDI floor controller that engages Channel 3 (Lead 1) and turns on the effects loop, the foot switch will also turn on its Lead 1 and Loop LEDs to reflect the new setting! Of course, the amp front panel updates immediately as well. To take this example to the next level, let’s remove the generic MIDI floor controller and replace it with the KSR Amplification M/20 controller equipped with RCI™. With this setup we will still keep the Colossus foot switch, and it and the M/20 will be daisy-chained with an RCI™ cable. At the other end the RCI™ cable connects to the Colossus and an additional piece of gear, the KSR Amplification 8 channel loop switcher. This single cable supplies power to both foot switches and moves the data signals between all four RCI™ equipped devices. Once all these KSR Amplification devices are connected together, things start to get interesting. The M/20 is the brains behind the operation and it stores patches containing amp settings, loop switcher settings, and MIDI settings. To create a new patch simply select the amp settings with the amp foot switch or front panel, turn on the desired loops with the M/20 or loop switcher front panel, and press Store on the M/20. Now, a patch has been created from a snapshot of all these settings! Simply repeat this process for other channels, effects, modes, etc, it’s that easy. If once a patch has been stored you change a setting, such as the amp channel, RCI™ will signal the change to the M/20 and it will blink its Store LED indicating the patch has changed. If you simply hit Store, this change has been saved! Each preset will also store any number of MIDI PC or CC commands to be sent in order to setup MIDI enabled. With the contact closure capability of the 8 channel loop switcher, one may also output the M/20’s patch based tempo as an automatic tap-tempo output. Any KSR Amplification device that has both MIDI and RCI™ ports is also guaranteed to broadcast MIDI information. This means you can connect MIDI devices to your M/20 controller at your feet that will also be linked to MIDI devices connected to an amp or loop switcher in the rack. Since the RCI™ cables are capable of transmitting data at least 250 feet, the hardware can also function as a MIDI repeater of sorts. With the current RCI™ protocol up to 255 KSR Amplification devices may coexist on the bus at a time. This includes amplifiers, loop switchers, floor controllers, etc. The Colossus was my first KSR purchase back in 2016. Although it’s a 4 channel amp the mode switches essentially make it a 7 channel monstrosity. Love how much the ‘Level’ switches allowed me to dial in the perfect amount of saturation, separate from the gain knobs. My favorite sounds out of this amp where on the crunch channel, gain maxed, with a very light pedal boost. Absolutely heavenly! At no point do the EQ knobs feel ‘useless’ or ‘dead’, regardless if they’re maxed out or on zero. Every possible way you can set the colossus has a realistic function when either running the amp by itself or with boosts in the front. I purchased my Colossus around 2015/2016. I learned a vital and lifelong lesson the second I turned it on. I learned that there is such a thing as the perfect amplifier. My colossus was my go to amp (until I purchased my Orthos the beginning of 2018). The best feature that the colossus offers is the amazing amount of channel flexibility. I swear, you can dial in any tone your ears could ever want. From crystal clean to br00tal. It is my main studio amp for sessions and home recording, simply because of its incredible variety of channels and flexibility. If you’re looking for an amp that can do it all and do it all perfectly, look no further fam. THE BEST AMP I’VE EVER OWNED!!! I know that “the best amp” concept can sometimes be a bit biased or difficult to comprehend, but let me try and explain what I mean. I remember many years ago when one of my favorite sports/hobbies was trying out new amps. It can surely be a fun activity, but it can definitely become frustrating if you know the exact tone you’re chasing and cannot fully find it. Back in the day, I would buy an amp, own it for 6 months -when I would intensively play with it in lots and lots of different scenarios-, and end up selling it to finance a new project/amp. Some experiences were more rewarding than others for sure. Victims of that trend were companies such as Bogner, CAA, Engl, Marshall, Mesa/Boogie, Egnater, Diezel, Fryette, Suhr, and many others. After having owned numerous rigs, I came to the point where I thought I was almost there tone-wise speaking. The Mesa/Boogie Mark V was giving me that clean channel I’d always dreamt of and a crushing lead tone that was very pleasing to my ears. I could have stopped my quest right there, but you tone-freaks know how this works: The quest for tone never ends! Back in 2012, I was fortunate enough to meet a great guy and incredible amp builder, Kyle Rhodes, who introduced me to the mighty Colossus H-100. I was immediately impressed and, of course, decided to buy one and do all the regular tests I do with every single amp I own. The results were… well… mind blowing! All of a sudden, the wonderful Mark V clean sounded thin and lifeless, and its pleasing lead channel started to lack “balls”. 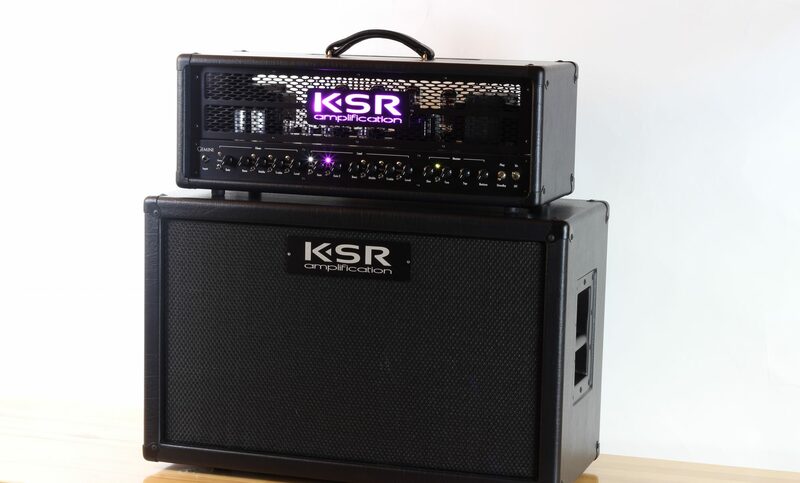 Most people see KSR Amps as metal beasts, and they surely do a great job in that realm. But there’s much more to Kyle’s creations. The Colossus is so versatile that it can offer you whatever you might be looking for. Wanna play blues, jazz, American rock, hair metal, thrash, and everything else in between? The Colossus can take you there in the blink of an eye. Trust me when I say that I would still own this amp exclusively for the Clean and Crunch channels. I remember always looking for that drive pedal that would give me the perfect light crunch to complement my 2/3-channel amps. That search is over now because nothing sounds like the Colossus’ Crunch. I truly believe that you could have a single-channel amp with that exact crunch and it would definitely be THE BEST single-channel amp ever made! Regarding the Clean channel, after having tried dozens and dozens of amps, very few of them come close to what the Colossus can do. You simply need to try it and you’ll see how sweet, smooth, and responsive it can be. And of course, when it comes to the two Lead channels, well… you simply cannot beat KSR. I could say that they’re perfect just by their articulation alone, but there’s much more to them. They’re crunchy, ballsy, organic, but sweet and tender at the same time. It’s an experience you have to try for yourself. In a nutshell, if you’re after tonal bliss, KSR Amps is the way to go. Picture a hot witch casting a spell on your ears… a spell you can’t possibly break. Just do yourself a favor, go KSR, and thank me later. I’ve been using the Colossus since 2012 and have never looked back. I HAVE FOUND TONE. And if all that weren’t more than enough, Kyle’s an awesome dude, and you should always take your business to those people who’re really worth it. In a world full of jackasses with mountain-high egos, we should always do our best to try and support companies like KSR Amps. Had my Colossus for 4 years. Its never had an issue. Built like a tank. It is hard to describe the tone, but when you hear it in person it is very tight but with a rich gain that has enough growl to be used without pedals. The clean channel is in a league of its own as well. Beats any other amp for lower volume playing but when you crank it up then it really becomes the Beast it was meant to be. I’ve owned alot of high end gear and this amp isn’t going anywhere……EVER…….. Literally best Amp I’ve played through, owned, looked at, breathed near, blah. Seriously. Let’s start with the clean.. Do you like having the clearest clean channel with absolutely no hum? Cool, got it. Would you like to add gain and break it up just a little for some bite? Sounds perfect. Would you like to push it with a preamp or distortion and go into nuts-land? Does that too. Let’s say you’re going for a classic rock vibe. Now you have the perfect channel to do that with. You can literally go from light crunch jamming, to pushed hard mega crunch, or anywhere in between. I mean you could easily dial into a modern metal tone on the crunch Channel which brings me to my next one. I’m going to group the distortion channels 3+4 together as they’re both amazing. Seriously I can’t say enough good about how soul crushingly perfect these are. They destroy every other high-end Amp I’ve ever had in terms of how clear I can keep my playing while having an f’n mountain of distortion over top. You can dial in the heaviest br00tlz chugs or tighten everything up to duh-jent duh-jent your neighbors into madness. All in all can’t say enough good things about colossus. You get everything in one..
It’s really the end-game amp is what I’m saying.